A new survey has found the majority of young Australians (81%) have a strong desire to advance reconciliation—but less than half know how to go about it. A new survey has found the majority of young Australians (81%) have a strong desire to advance reconciliation – but less than half know how to go about it. 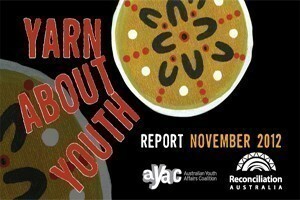 The 'Yarn About Youth' report, co-authored by Reconciliation Australia and the Australian Youth Affairs Coalition, contains findings from a national survey of young peoples' attitudes to reconciliation. The results indicate the majority of young people believe trust between Indigenous and non-Indigenous Australians is low but 90% think the relationship is important. 80% think Australia is better off because we have many different cultures? 51% think the relationship is improving? 35% think the relationship is good? The report represents the views from 740 young people aged 15 to 26 surveyed online from May to July, and representatives from 22 key youth sector organisations who met to discuss the survey findings and ways forward. "Young people overwhelming feel the relationship between Aboriginal and Torres Strait Islander and non-Indigenous people is really important, but it is strained by prejudice and a lack of trust. This report makes clear that the vast majority of young people want to be a part of healing the relationship. As one young person said 'we do not want to just close the gap, we want to smash the gap! '," Executive Director of the Australian Youth Affairs Coalition, Andrew Cummings, said. Aboriginal and Torres Strait Islander young people identified 'racism, discrimination and prejudice' as the most important issue in Australia today. Non-Indigenous young people identified it as the second most important issue. In comparing responses from young people to those of older generations, the survey found that three in four non-Indigenous young people are proud of Aboriginal and Torres Strait Islander culture compared with two in four non-Indigenous people from older generations. Reconciliation Australia and the Australian Youth Affairs Coalition say every Australian – young or old, at home, in their community, in businesses, in government, in the Not for Profit sector – should think about how they can support change towards reconciliation. "There's no single strand to reconciliation. It takes lots of people doing lots of different things sharing a common goal. Seven out of ten young people we surveyed are already talking to others about Aboriginal and Torres Strait Islander issues. Everyday actions like these make a significant contribution to improving the relationship," Chief Executive Officer at Reconciliation Australia Leah Armstrong said.